Searching for a way to boost sales? It’s way more than a typical leaderboard (it’s somewhat similar to BunchBall or Hoopla). 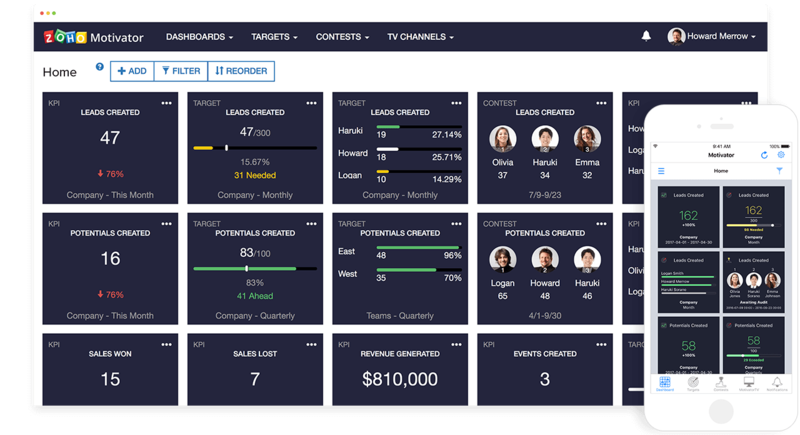 The tool lets you see real-time data from your CRM, set goals for your team, and create contests to motivate sales reps to bring in more sales and hit their target numbers. The idea behind Motivator is to encourage the behaviors that get results. It works by helping you isolate patterns and habits that lead to better results (think entering data or following up with prospects). Once you isolate those behaviors, create motivators to reinforce them. It’s all about fun (and a whole lot more sales)! At the heart of Motivators is fun. The software uses fun as a motivator to keep sales agents on track for their targets. It all starts with getting the right insights. Get the data that matters most reported in real-time. Then, set targets and contests to promote the behavior that leads to the most desirable outcomes. The contests present clear goals that agents can proactively and purposely work toward. Sure, Motivator has a sales leaderboard, but it goes beyond that. Reps are rewarded and recognized for their hard work. Because the goals are clear, each rep can work on improving behavior that ultimately leads to more sales. The contests work to add energy and fun to the office. You can even broadcast results and key metrics on TVs in the office to stay front of mind and keep reps motivated day in and day out. The broadcasts drive CRM adoption, sales team engagement, and improved performance. Plus, it’s just a whole lot of fun. Motivator pulls data from your CRM. It can access all of the important metrics, but you get to decide what’s important for your sales team to focus on. Motivator supports leads, accounts, contacts, potentials, tasks, events, calls, campaigns, solutions, products, vendors, quotes, orders, and invoices. They’ve got all your bases covered! If you’re looking for increased performance and a whole lot of fun on the sales floor, give Zoho Motivator a try. It’s a lot more than a typical leaderboard, and the integration with Zoho CRM means running contests and keeping track of your reps performance won’t add to your existing workload!